Architects Welsh + Major describe this design quite simply as “a house with tiles on it”. 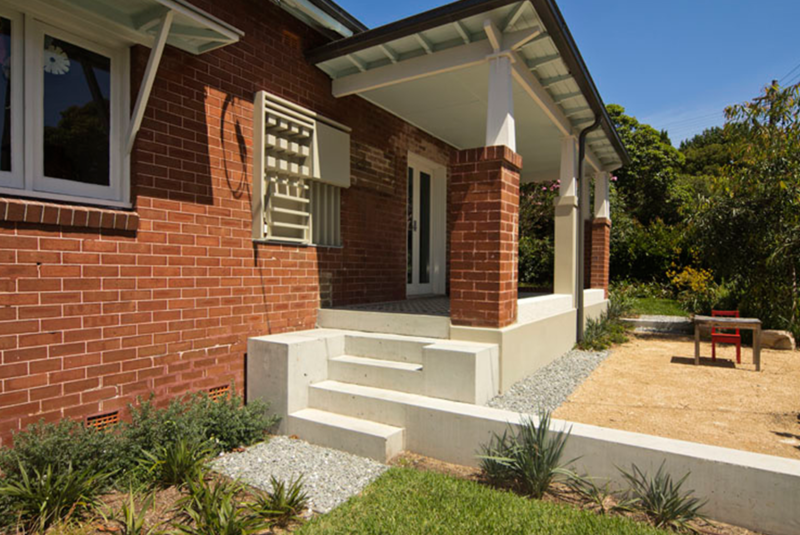 Their brief from their client was to reinvigorate this 1920s Haberfield house for a family of four, re-instating the dignity of the original home and re-connecting it with new garden spaces. 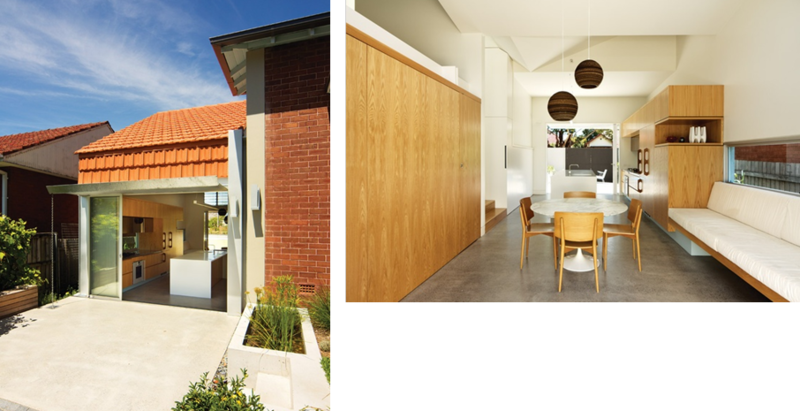 Their response was to add a single-storey pavilion and adjusting the sloped side gardens into a series of winter and summer spaces that can be accessed from a number of rooms. The house is located in a heritage conservation area. The existing house was typical of many federation houses, a freestanding bungalow that has been added to sometime in the sixties or seventies. The original house had been further closed in on with the block being subdivided sometime in the 1950’s. Haberfield, located 9km west of Sydney CBD, was established as a “model city” in 1901 and is characterised by its character homes, many from the Victorian and Federation era, good sized blocks and well established parks and gardens. Haberfield was the first Sydney suburb to be recognised as a Heritage Conservation Area and a strict Development Control Plan accompanies this heritage status. Building, renovation and extension restrictions, which can be onerous and off-putting for potential buyers, include bans on demolition, requirements for uniform street setbacks, controls on picket or wire fencing and height limits. 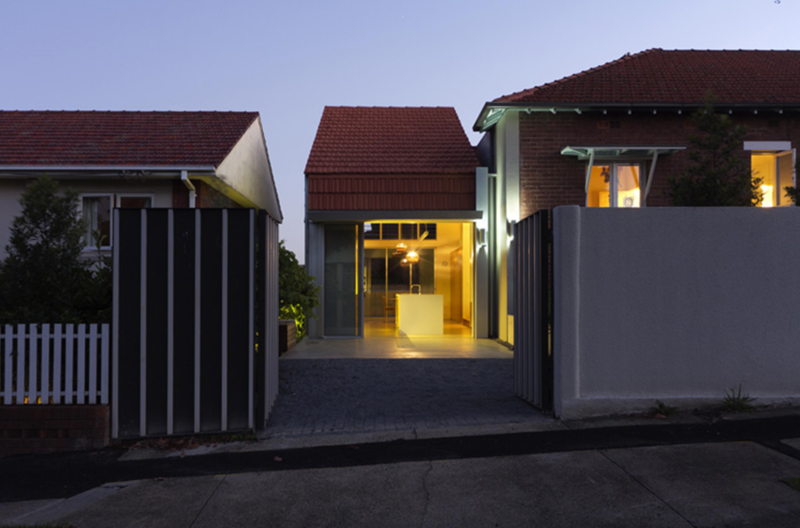 Their solution was an extension wrapped in terracotta roof tiles that marries well with the heritage street-scape, while retaining a contemporary look. The plan is that over time, the tiles on the new pavilion will weather and accumulate lichen, and will blend with the overall look of the street. They also updated the veranda with new tessellated tiles and bespoke zinc light fittings. As the original house was in good condition, interventions to it were kept to a minimum. New durable tallow-wood floorboards tie in with the oak veneer finishes. Welsh and Major has changed the functions of the front rooms: the former main bedroom has become the lounge room, and the former lounge/dining area is now the main bedroom, which has a discreet “timber box” en suite that stops short of the ceiling, retains the generous proportions of the main bedroom and leaves space for walk-in robes. New material includes exposed concrete, veneers from certified slow-growth forest timbers and light fixtures fashioned from Zincalume steel .